Lukose Paret is Knanaya, but his wife, Aleyamma, is not. He claims their mixed marriage has led to discrimination against the couple by their church. He says he is banned from church committees and letters to his priest are returned unopened. 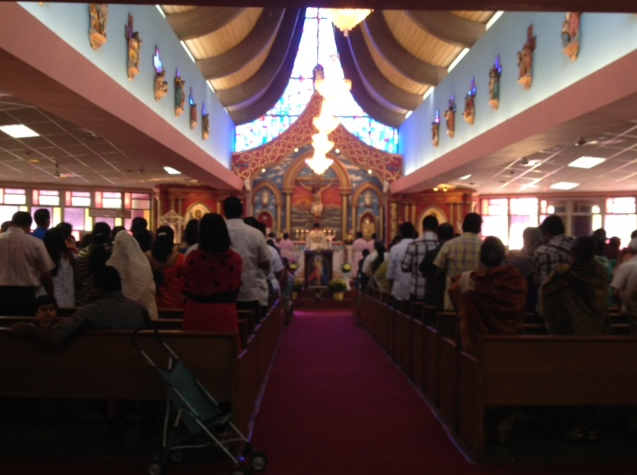 A small group of Indian Catholics is petitioning the Vatican to stop what they claim are discriminatory practices in their U.S. churches. The Knanaya, a small sect estimated at 400,000 worldwide, have concentrated in the Chicago area over the last five decades. Now a rift over whether they should continue their ancient observance of endogamy, where members only marry within their ethnic group, has spilled into public view. Pullappally is one of a small, but growing, group of American Knanites who have filed a canonical lawsuit within the Catholic Church’s legal system. She and the others have married outside the Knanaya church, an act that they claim has led to discriminatory treatment. In Pullappally’s case, her husband is Protestant, and so she says her family is being denied certain rights. “[T]he right to conduct your wedding at that church, the right to baptize your child at that church,” said Pullappally. A fellow complainant, Lukose Paret, produced several letters he attempted to send to a priest at one of the two Chicago-area churches, along with receipts showing they were declined and sent back unopened. He and others say they are barred from joining church committees, their homes are shunned during Christmas caroling events, and their children are not welcome to participate in youth activities. “Basically the Knanaya church is walking a tightrope between maintenance of these age-old endogamous traditions, and knowledge that America is a new land where inclusivity is the rule,” said Pullappally. The disagreement within the church spilled onto the streets in March, however, when several hundred Knanaya rallied outside their bishop’s house in Elmhurst. The protest was in response to a letter issued by Bishop Jacob Angadiath, who oversees the St. Thomas Syro-Malabar Catholic Diocese of Chicago. Angadiath had ordered churches in the diocese to be more inclusive of mixed-Knanaya families, or families where only one spouse is a full-blooded Knanaya. Angadiath did not respond to multiple requests for interview. “It is totally against our principle,” said Tomy Myalkarapuram, president of the Knanaya Catholic Congress of North America, a laypeople organization that claims 20,000 members. “We have every right to remain as (an) ethnic group and as (an) endogamous group,” he added. Myalkarapuram said endogamy is the essence of the Knanaya community, and that the larger Catholic Church should not ask the Knanaya to sacrifice a defining characteristic of their identity. In fact, since the Knanaya church was folded into the Catholic Church several centuries ago, the concept of endogamy has never sat well with Rome. “It sounds as if you are excluding people from the church if you have your own separate endogamous church,” said Richard Swiderski, an anthropologist who studied Knanaya endogamy in India. Swiderski said the Catholic Church held its nose and allowed the Knanaya in India to continue the practice, but that it did not intend for the tradition to be carried over to other countries. However, he noted that any forced change would run afoul of long-held beliefs. Swiderski said the Knanaya believe they descended from Middle Easterners who settled in southern India in 345 AD., making them racially distinct from other Indians. He said ever since then, they have tried to preserve their spiritual distinction, a belief that they represent a version of Christianity untainted by outside cultures, through endogamy. The controversy may ultimately be resolved by people within the community: a younger generation of Knanites who debate whether endogamy makes sense in an American context. In the meantime, Pullappally says the church has already lost one of its youngest members -- her son. Days before he was baptized, she explained her decision not to have it done in a Knanaya church.